Michigan State basketball will take on Michigan Tuesday night and here’s what the Spartan Avenue staff believes the final score will be. Last time Michigan State and Michigan met up, the Spartans asserted its dominance in the recent series and defeated the Wolverines, 70-62. Tom Izzo is hoping his guys play similarly, but with an even larger sense of urgency. The weeks are winding down the the NCAA Tournament is a little over a month away. 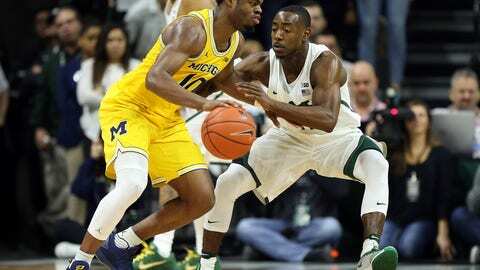 Will Michigan State make one final push toward March with a big road win in Ann Arbor? Here are the staff score predictions for Tuesday’s Michigan State vs Michigan game. Connor Muldowney: The first meeting between these two teams got a little chippy when Mo Wagner swatted at Cassius Winston when he was laying on the ground, but the Wolverines’ big man still had a big game. Nick Ward is going to have his way down low with Wagner this time. The Spartans are going to get the ball into the post to a healthy Ward and he’s going to go off for 18 points. Miles Bridges will add 15 and McQuaid will hit a couple of big threes again. Ryan McCumber: MSU has finally seemed to learn how to play forty minutes in its last two games. On the other hand, Michigan is reeling, struggling and desperate. The Spartans need a big game from Nick Ward. He should be able to dominate Mo Wagner who’s not a very good defensive player. However, I believe Michigan is due for a good shooting game and that someone other than Derrick Walton will actually step up for the Wolverines. Could that be Zak Irvin who has gone missing the last two games? I think it could be. Michigan wins a close game. Daniel Gottschalk: Michigan State took care of the Wolverines at the Breslin Center just nine days ago, but now will have to travel to Ann Arbor and try for the season sweep tonight in Crisler. The Spartans rode the backs of the emerging three-headed monster of Miles Bridges, Nick Ward and Cassius Winston, while also getting a few key threes from Matt McQuaid. I expect those three to lead the team again, with Bridges and Ward improving on their previous 15 and 13-point performances, respectively. Bridges had a somewhat shaky shooting performance despite scoring 15 points. Ward was hampered by the flu and foul trouble in the last match-up, limiting him to just 16 minutes. Michigan will start out strong behind the red-hot Derrick Walton, but will fade late in the game and Michigan State’s defense tightens up and Nick Ward wears the Wolverines down in the post. Brooks Hepp: Michigan has the offensive fire power to be dangerous in any game this season. This game will be decided by the play of point guard Derrick Walton Jr., who initiates that prolific offense. Watch out for more Tum Tum Nairn instead of Cassius Winston because the former is the better defender. Walton popped off for 24 points last time these teams played and kept the Wolverines in the game. I predict a less impressive outing by Walton and a big game by Michigan State’s front court. Spartans pull away late, but the game will be closer than the score. Adam Zdroik: When teams are desperate, they play better. Michigan State was desperate a week ago, but is feeling better after a couple wins. Michigan has a tough remaining schedule and cannot afford to lose this game. The Wolverines will get more from DJ Wilson, Zak Irvin and Mo Wagner and that’ll be the difference as MSU goes 5-of-18 from deep and Matt McQuaid misses two more layups. Michael Briggs: Michigan State looks like a team again — not just the Miles Bridges show — and that’s bad news for the rest of the Big Ten. Michigan has dropped consecutive games to rivals MSU and Ohio State, but should keep this close at home until the middle of the second half. The Spartans will get big performances from the backcourt pairing of Cassius Winston and Matt McQuaid, as well as a healthy dose of Nick Ward in the post, en route to a season sweep of the Wolverines. Stephen Robb: Michigan State Spartans travel to Ann Arbor to further their run for the tourney. While the Wolverines have struggled this season, I believe they make this another close contest. Derrick Walton Jr. has an excellent game for the Maize and Blue while Miles Bridges dominates with his athleticism.